Tis the season for shrimp and crawfish boils! With a unique blend of savory and hot spices and herbs, our Crab, Shrimp & Crawfish Boil Seasoning will leave you and your friends licking your fingers and wanting more. Perfect for a Friday night Lenten dish or a spring break neighborhood block party, this is a really fun meal that’s simple and is easy to prepare. In a large pot, bring the water to a boil. Add your potatoes, garlic, onion, other vegetables and seasoning, and cook until the potatoes are soft – about 12 minutes. 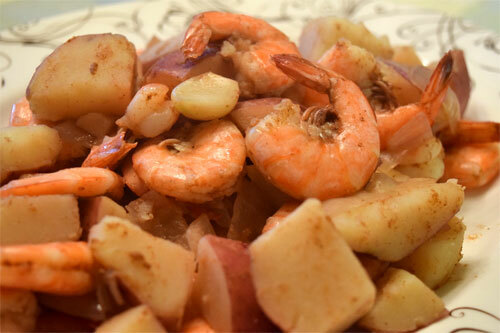 Lastly, throw in your shrimp and cook until just pink, about 2 minutes. Be careful not to overcook, or the shrimp will become chewy and tough to eat. Strain, serve, and get peeling!